Do you want to find out how much your Uber will cost before you request it? You might hesitate to get an Uber ride if you don’t know what the typical Uber rates are. Will your ride be $5 or $50? Luckily, Uber provides up-front cost estimates right inside the app. To get a fare estimate, download the Uber app and input your destination. After you input your destination, the app will display a fare estimate for each service.Disclosure: Download link is my referral link and I may receive a commission for referring you. How does Uber come up with the cost of a ride, and what else do you need to know about the cost of an Uber before you request a ride? I explain how Uber pricing works below, and I explain how the ride type you choose determines the cost of your ride. Uber launched the upfront pricing feature in 2016, which tells you how much you’ll pay as soon as you enter your destination before you request it. All you have to do is input your destination to see how much your ride will cost. Up-front pricing complications: How does Uber come up with their prices? Before up-front pricing, it was easy to figure out why your Uber cost as much as it did because it was based on the above mileage + time equation. With up front pricing, the pricing calculation has become less clear. Up front prices are still based on mileage and time, but they also include a vague ‘willingness to pay’ factor that isn’t clearly disclosed and explained. Another downside to up front pricing is that it’s no longer obvious how surge charges are added to your bill. Before, you would see an on-screen indicator letting you know about pricing surges. Now, you only see the up front price with little or no indication that there is a surge. To give you a feel for the range of Uber fare costs, here’s a look at the fare costs in Los Angeles. LA features almost every Uber service and the prices aren’t much higher or much lower than other US Uber markets. To see see the exact Uber rates for your city, visit Uber.com/ride. Uber prices depend on the city you’re in and the Uber service you use. Uber rates are different for UberX, XL, UberSelect, Black Car,and SUV. Read more about the differences between the Uber ride types. The table below is the cost of an example ride. It shows that the same ride has a different price depending on the service you choose. Note: This ride is 2.3 miles and 11 minutes long. The price may change due to time of day, traffic conditions, discounts, or surge pricing. Uber sets a minimum fare for each service to help fairly reimburse drivers for short rides. If the sum of the equation above is lower than the minimum fare, you’ll still be charged the minimum fare. For example: You take an UberX two blocks down the street. After you added up the variables, you calculated that your fare would only be $2.78. But in your area, the minimum fare for UberX is $4, so you will be charged $4 instead of $2.78. What is Uber surge pricing? During times of high rider demand, Uber may add a cost multiplier to the cost of your trip that is known as surge pricing, or dynamic pricing. In the past, Uber displayed a popup screen before you requested a ride letting you know that surge pricing is active, and how much the multiplier is. Uber no longer warns you about surge pricing with a popup. Instead, they simply display your up-front price, and if surge pricing is active, a small lightning symbol may appear next to the up-front price. Surge pricing changes dynamically depending on driver supply and rider demand. If the cost of your ride seems abnormally high, you can wait and see if the price goes down after a few minutes. Uber has an optional tipping feature that allows you to tip your driver electronically. The driver keeps 100% of the tip you leave. Tipping hasn’t always been customary for most Uber passengers, but many drivers expect and appreciate a tip. There are two ways to see how fare rates break down for each Uber service in your city: Through Uber desktop site, or inside the Uber app. There are several fees and tolls that you should be aware of before you request an Uber ride. Most importantly, the cancellation fee is a fee charged to you if you cancel a ride two minutes after requesting it, or if you take 5 minutes or longer to come out to the driver. The cancellation fee is typically around $5. The cost of any tolls are passed onto the passenger, so if your driver takes a toll road, the cost of the toll will be added to your final ride price. You will not have to give the driver cash or coins to pay for the toll. 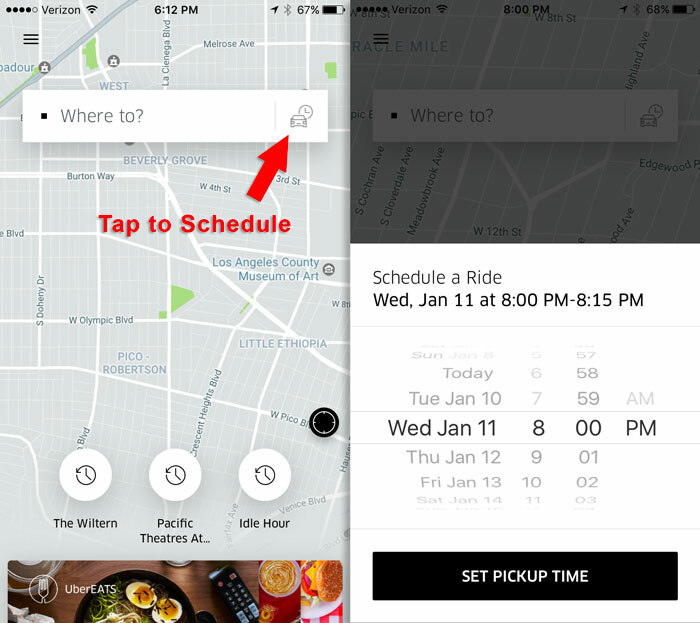 The Uber app allows you to schedule a ride request in advance. On the home screen, tap the clock + car icon next to the “Where To?” search bar to schedule a ride. Next, you pick the date, time, and pickup & drop off location. Although Uber calls it a scheduled ride, it is actually an automated request that goes off at the time you schedule. When you schedule a ride in the Uber app, a driver does not get information about your fare in advance and prepare for it. At the time of your scheduled ride, your account automatically sends a ride request, and to nearby drives it appears as an ordinary ride request. If there are no drivers around, you won’t get a ride even though you schedule it! So if you need an early morning ride to the airport, it might be better to open the app 20 minutes before you need to leave just to make sure drivers are nearby. Uber at the airport: Should you request an UberX or XL? If you’ve never tried Uber before and you want to know how much your ride will cost, download the app, input my promo code ‘cws7s2′ (works for USA only) then tap fare estimator. My promo code will give you $20 off your first ride, and I may also receive a commission or app credit for referring you.